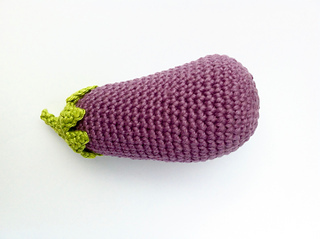 This aubergine is intended to be as lifelike as possible, with a gentle curve to its body and naturalistic uneven leaves. 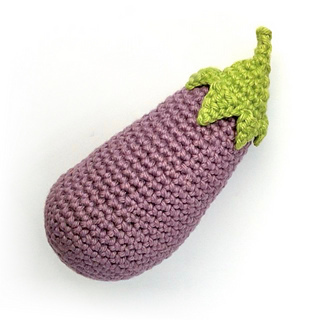 Of course you can easily work a larger or smaller eggplant/aubergine by using heavier or lighter yarn and varying your hook accordingly! 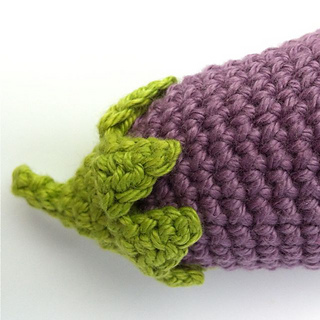 The pattern includes detailed notes on yarn and stuffing choices. I don’t like sewing up, so this pattern is worked all in one, without any sewing up to do, and you will only have three yarn tails to work in at the end! 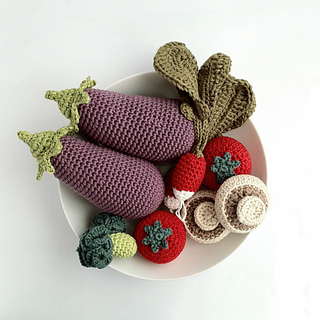 Please see my other patterns for more fruit and vegetables. A discount is available if you purchase more than two patterns.